Inert Gas Oven & Furnace | Pollution Control Products Co. The ultimate in safety, Pollution Control's patented InertGas models can handle any combustible that can legally be removed with heat, even space age engineered plastics and polymers. 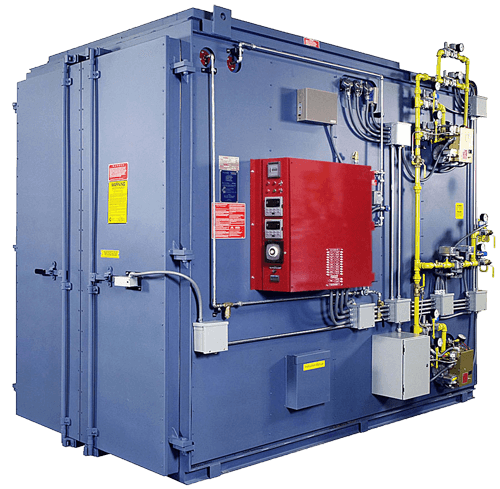 PCPC's InertGas ovens (U.S. Patent 4,557,203) expand the Controlled Pyrolysis® process with enhanced cleaning capabilities. InertGas furnaces leave the primary burner on during the initial "pyrolysis" stage of the cleaning cycle to produce an oxygen-deficient atmosphere inside the furnace (10% oxygen versus the usual 21% as in the air). Lower oxygen eliminates the danger of fire and allows for the safe processing of highly combustible materials in large volumes. During this initial "pyrolysis" stage, the IntertGas furnace temperature controller and the stack temperature controller each operate double water spray mists at double set-points for maximum protection. During the final "oxidation" stage of the process, the primary burner cycles on and off, increasing the oxygen level in the oven to completely oxidize any remaining char or carbon off the parts. The Primary Burner heats the cleaning chamber to 800ºF (427ºC). Volatile materials are driven off as smoke. The burner flame is confined to the combustion chamber never touching the parts. Automatic Time Cycles run the furnace only as long as it takes to process the load. Fully Automatic no cycle time or ramp recipe to select. Automatic Cool-Down if secondary burner fails during a cycle. Diagnostic Panel indicator lights reflect the operational status of the oven and its controls. Indicator light failure pin-points the problem. Door Switch, Purge Timer, Extra Gas Valve and High/Low Gas Pressure Switches enhance burner safety that may be required by some insurers. See all features and specifications.